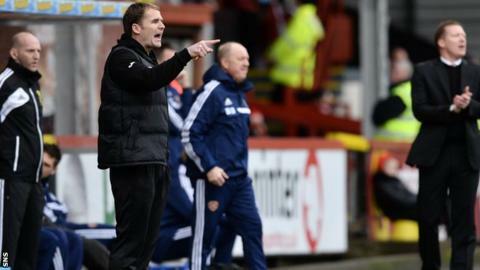 Partick Thistle manager Alan Archibald was at a loss to explain what went wrong as Partick Thistle went down to a 4-2 defeat at home to Hearts. Kris Doolan raced onto Lyle Taylor's defence-splitting pass inside five minutes to put the home side ahead. They could not build on their lead and, by the time Jordan McMillan hit a late consolation, Thistle were well beaten. Asked what went wrong, Archibald said: "I've just asked the players, because for 20 minutes we dominated." The result leaves the Firhill men in the relegation play-off spot ahead of the Scottish Premiership split after St Mirren picked up a late win at home to Motherwell - a result that also relegated Hearts. "We were creating chance after chance," Archibald told BBC Scotland. "They just stopped what they were doing so well and Hearts got right into the game. "Hearts changed a wee bit, but it shouldn't have mattered one little bit. I just thought we stopped doing what we were doing ever so well. "We were getting so much joy and causing Hearts all sorts of problems. But, for some reason, they stopped doing that and dropped that two or three yards back when Hearts had a wee bit of pressure. "Once Hearts got their goal, they were playing with a freedom, you can see that the way they've played and they deservedly got that goal and it could have been more before half-time. We were glad to get in at half-time. "We'll look at the video on Monday and take the positives from it, go over the negative stuff and we go again for Kilmarnock away." Thistle have just two home games left in their fight for survival, with trips to Rugby Park and both Edinburgh clubs after the split. "I think everyone in the bottom half of the league believes they can go beat each other, which I know they can," said the Jags boss. "That's what the split brings. It's cut-throat, someone's always going to be dropping points somewhere. "There's a lot of pressure that comes with it, but you've got to stand up to that."